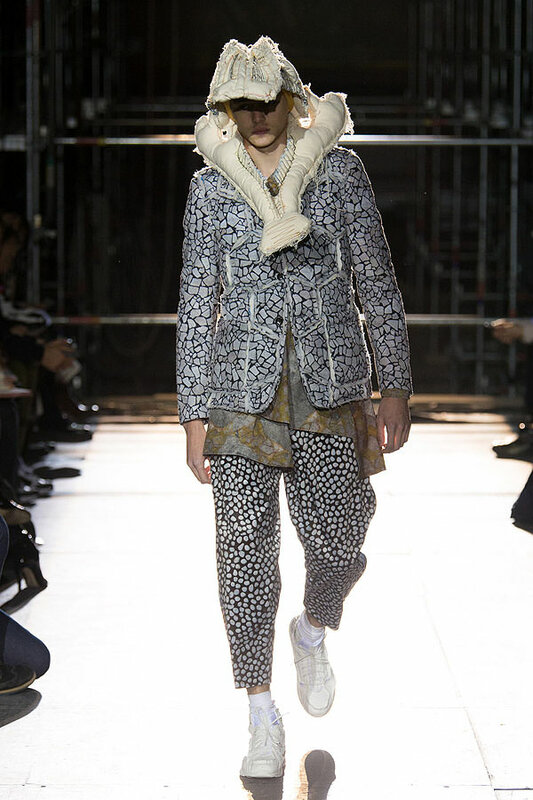 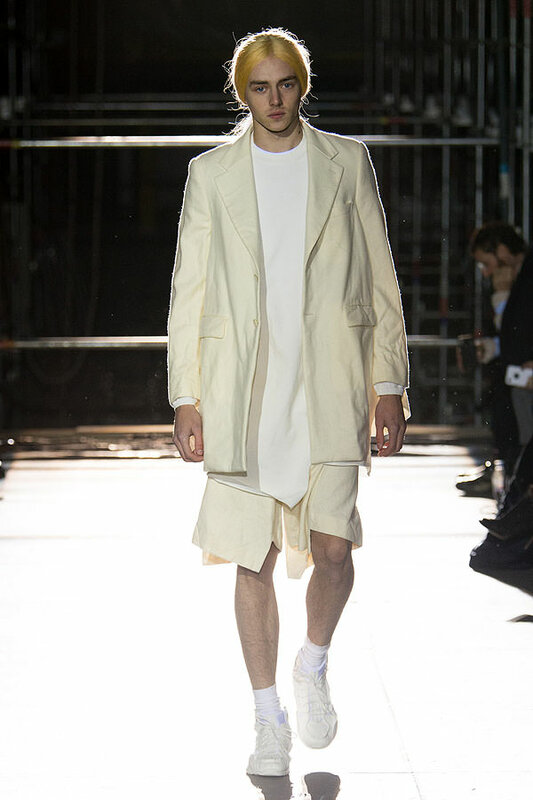 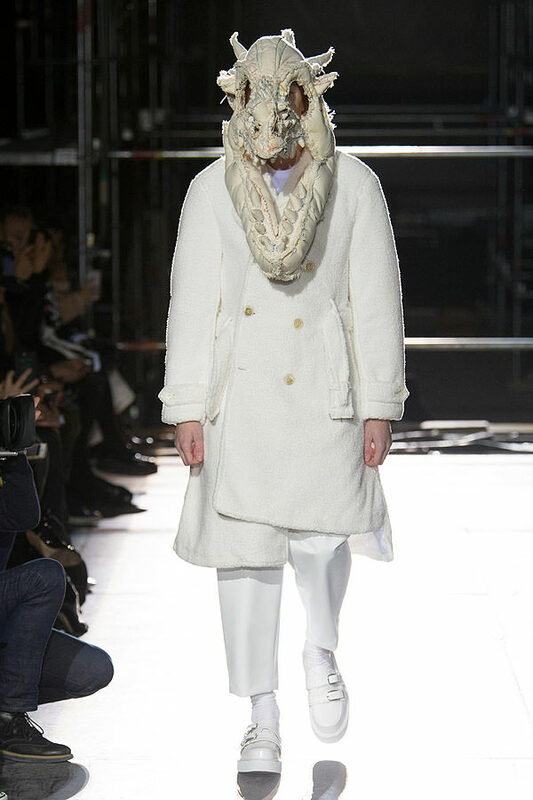 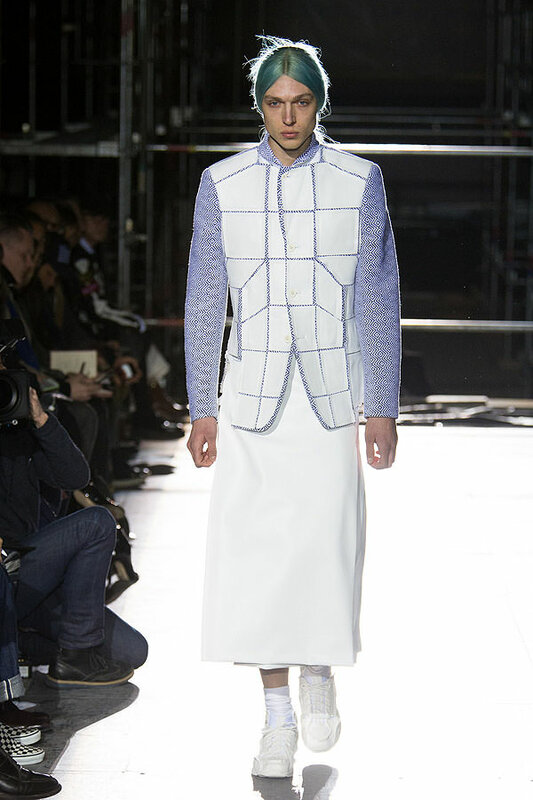 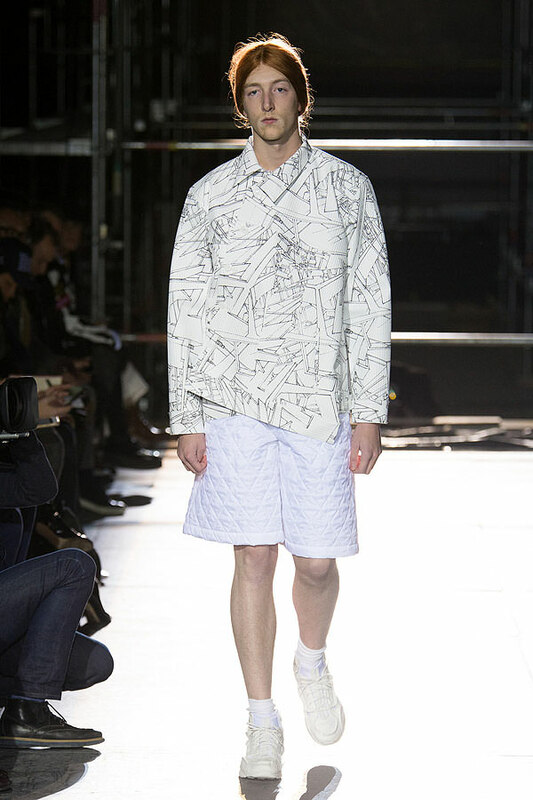 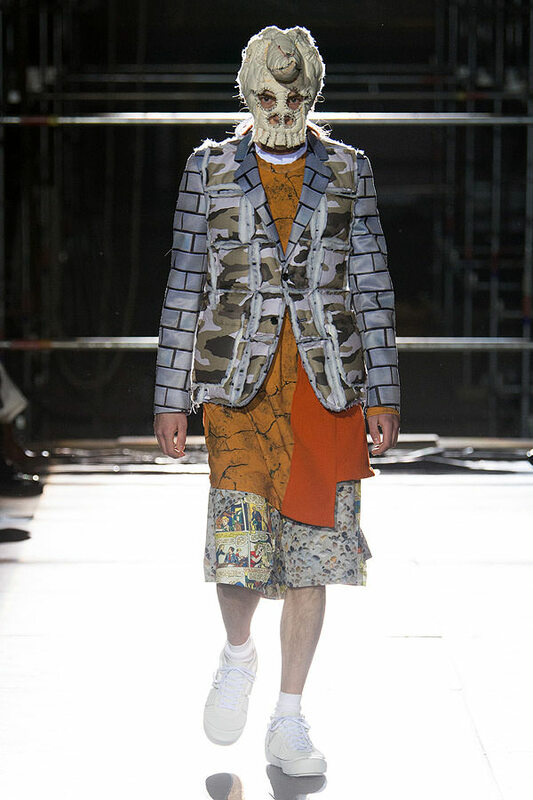 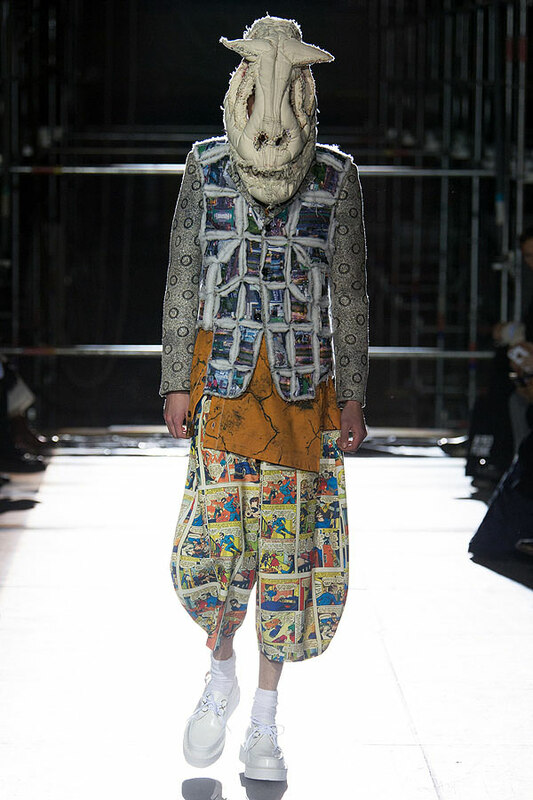 There was something carefree about the boys on Comme des Garçons’ runway today. 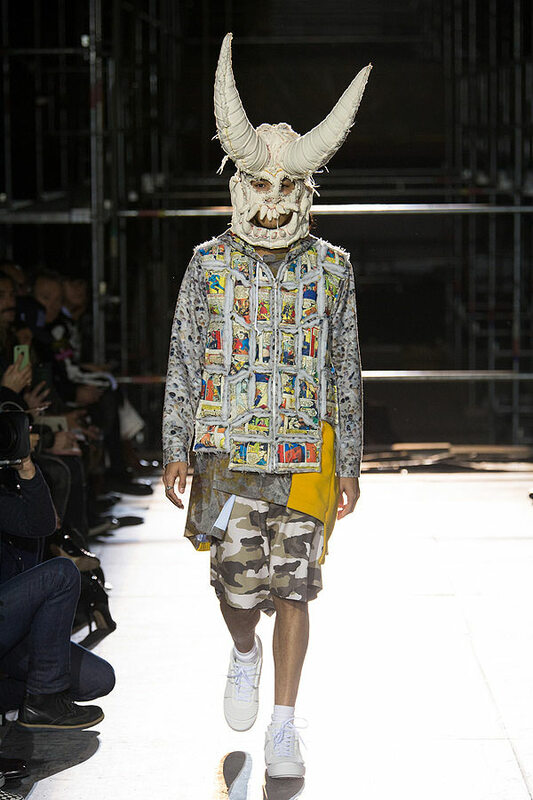 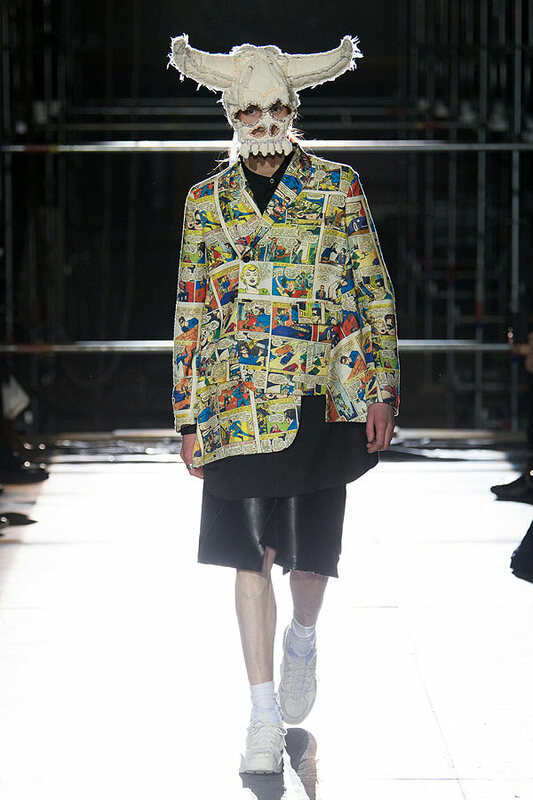 The show opened with a deconstructed tailored jacket, paired with a flowing superhero print trouser, and topped with a giant dinosaur head mask. 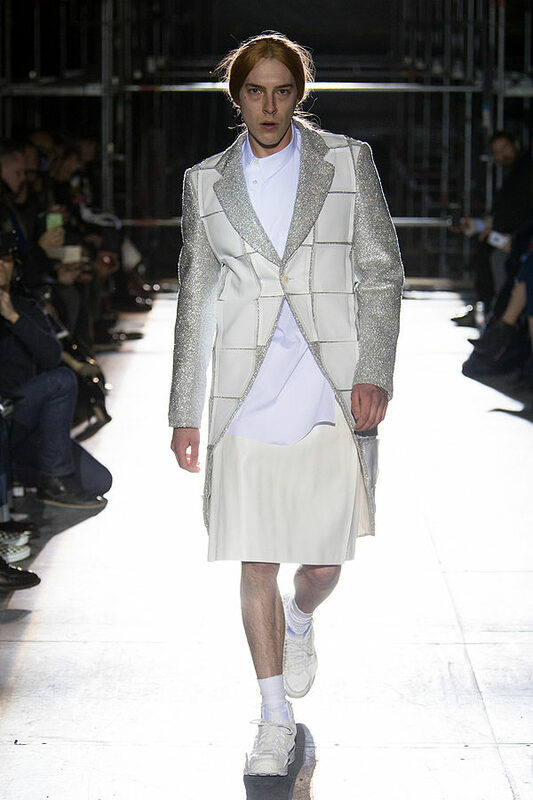 It was like watching young boys playing dress up, still in their pajamas, but being forced to go outside by their parents. 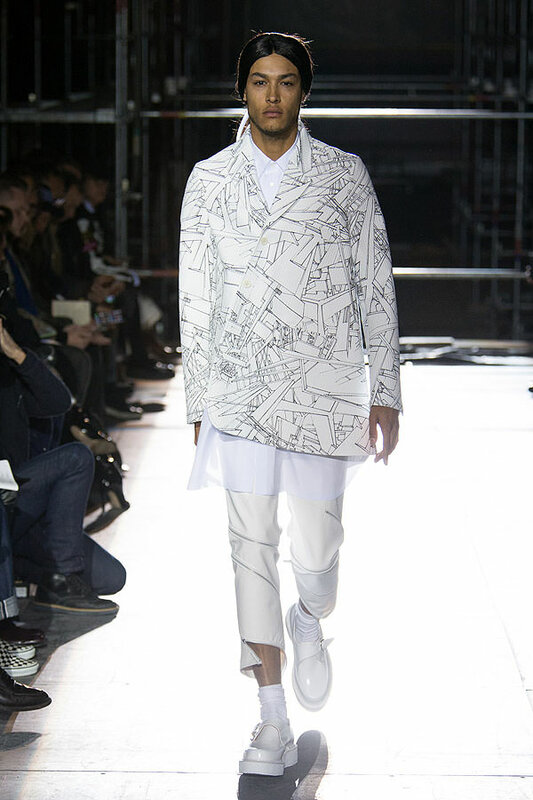 The prints developed into fragments of the city with concrete, brick print, terrazzo, birds-eye helicopter views and more, before disappearing completely and giving way to entirely white looks. 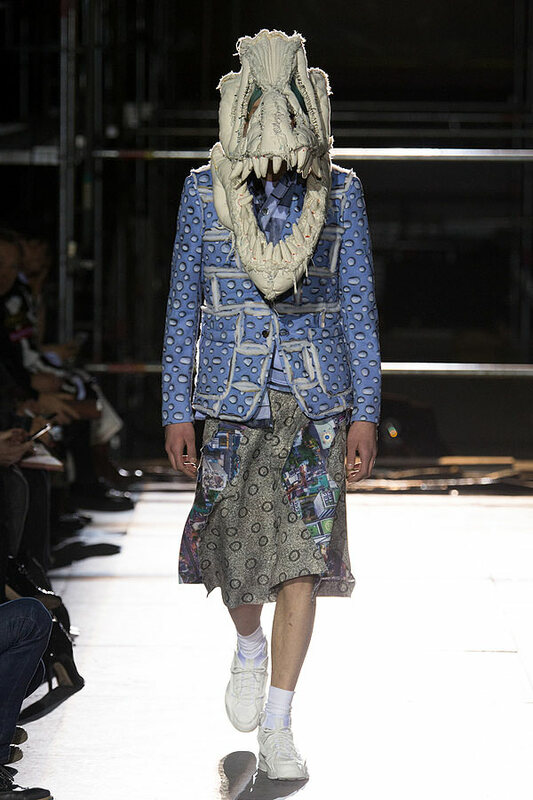 The dinosaur heads came off to reveal long center-parted hair loosely tied back with ribbons. 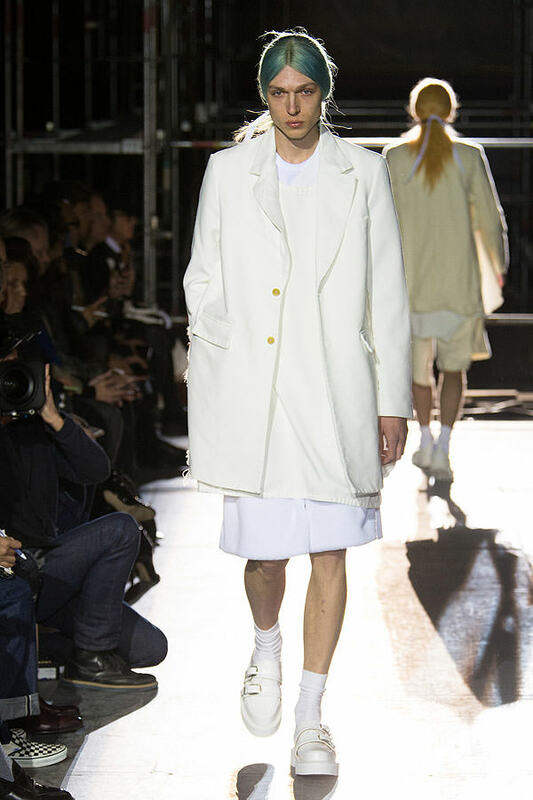 The boys were so fresh-faced they were androgynous. 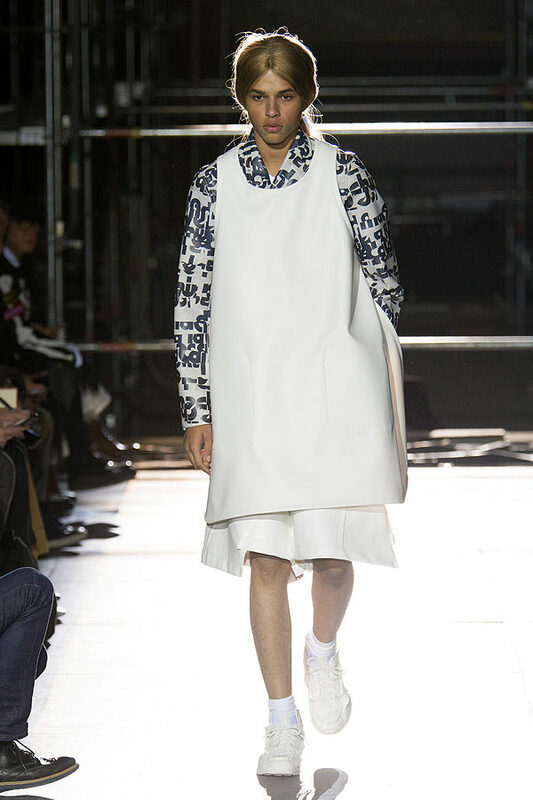 It was more a comment on youth and innocence than gender fluidity. 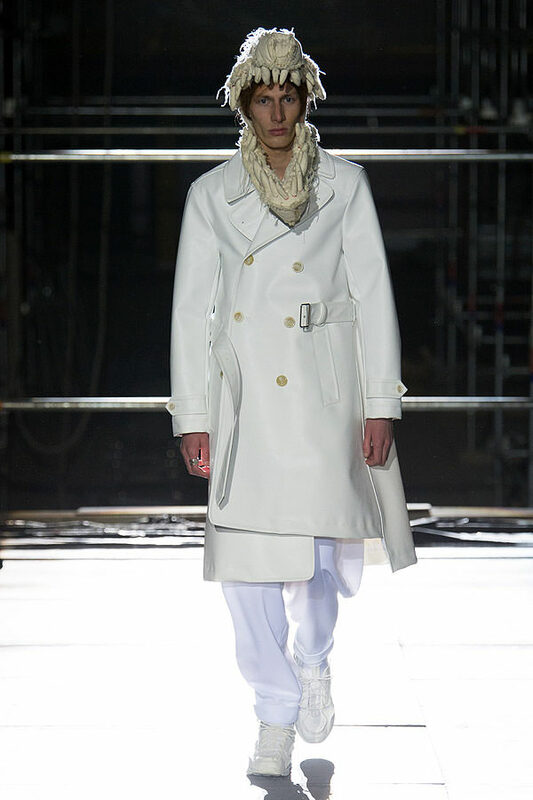 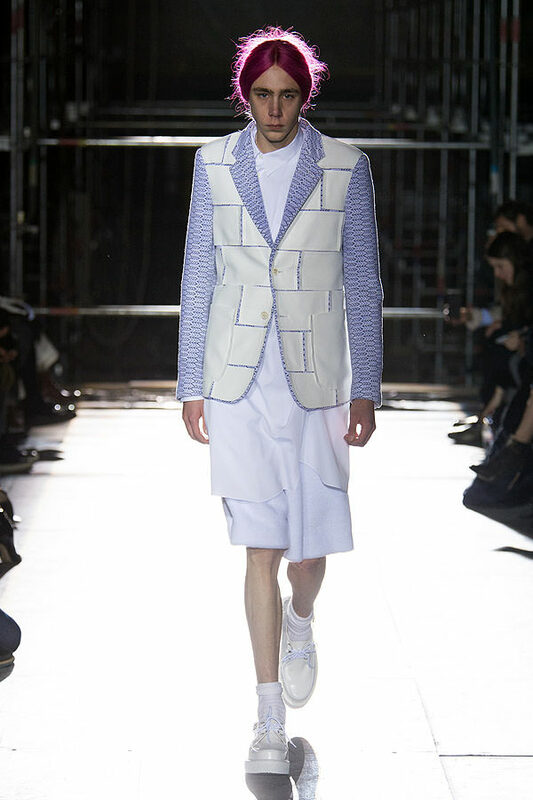 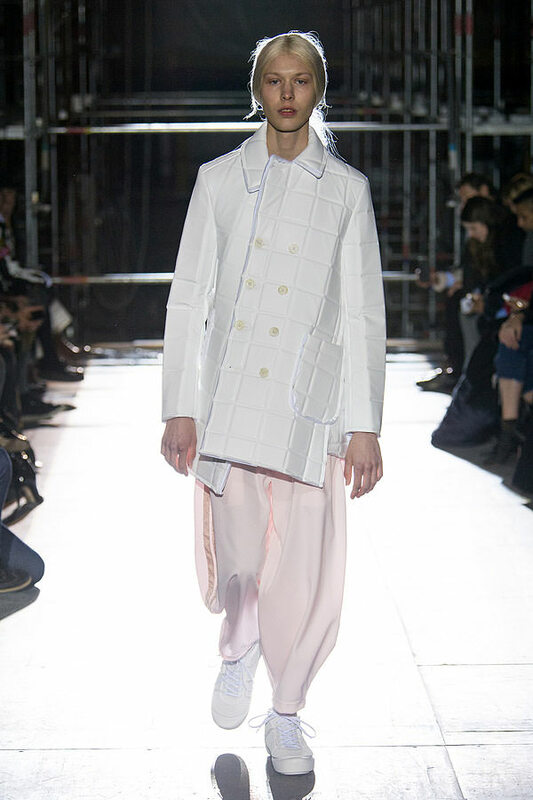 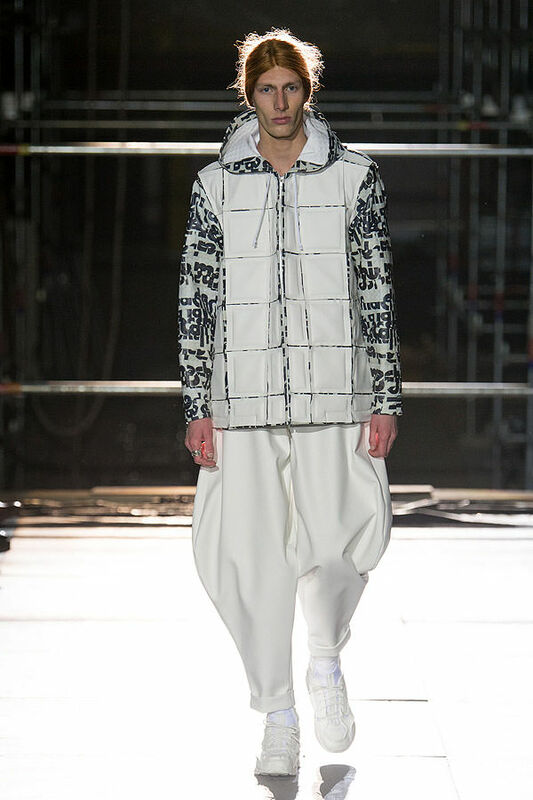 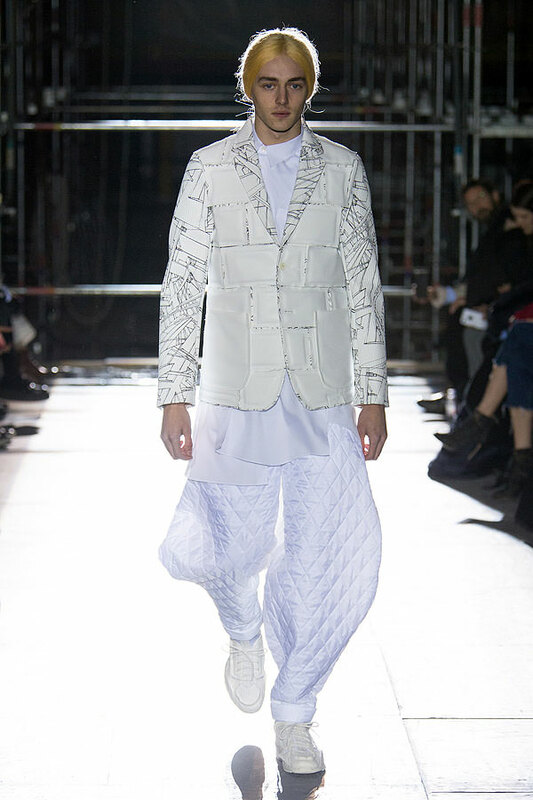 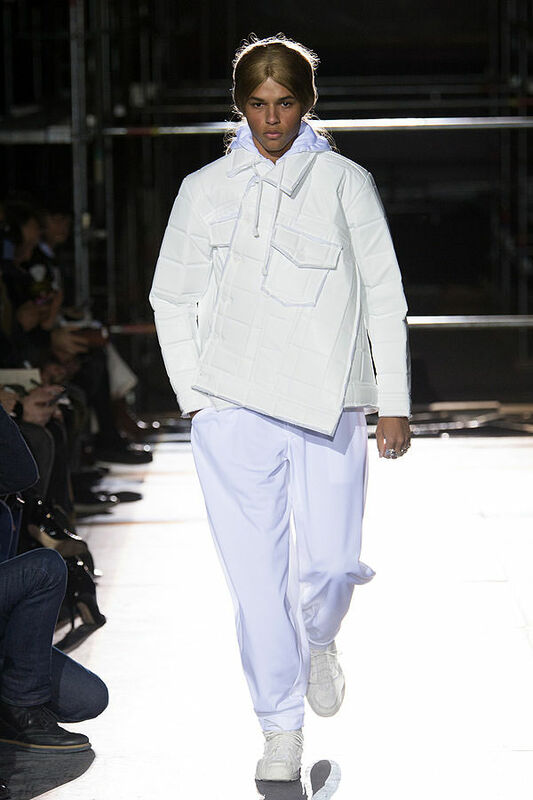 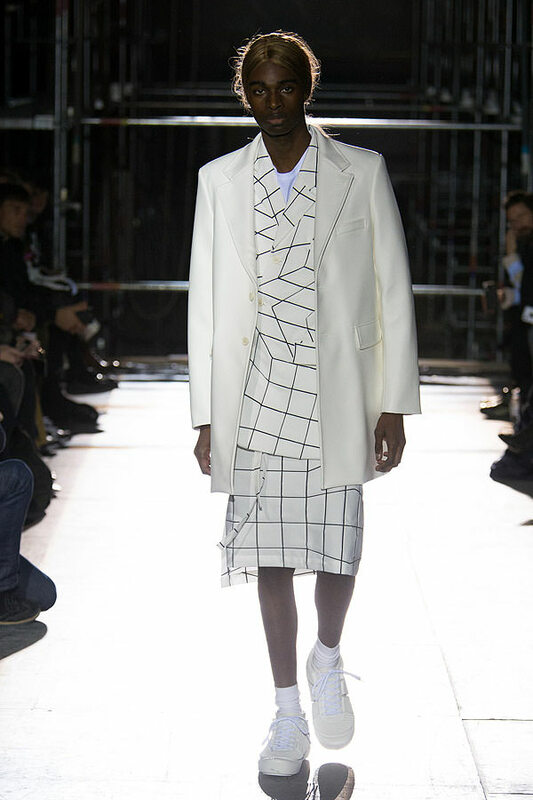 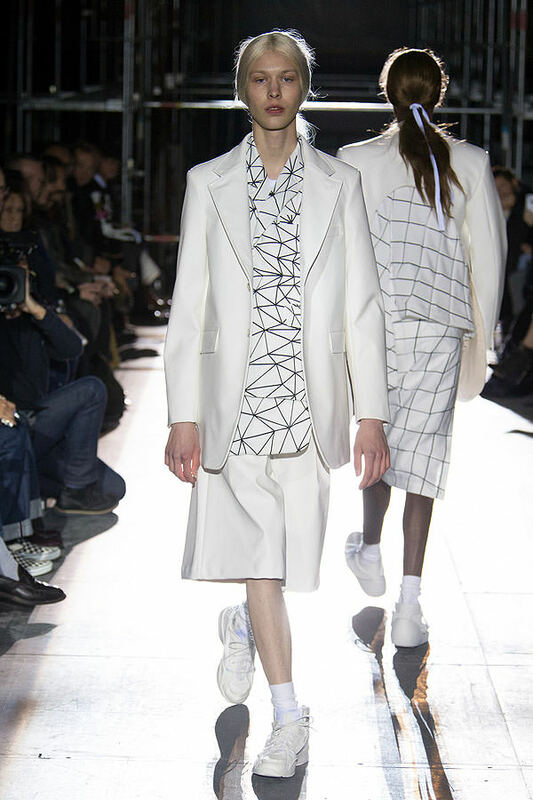 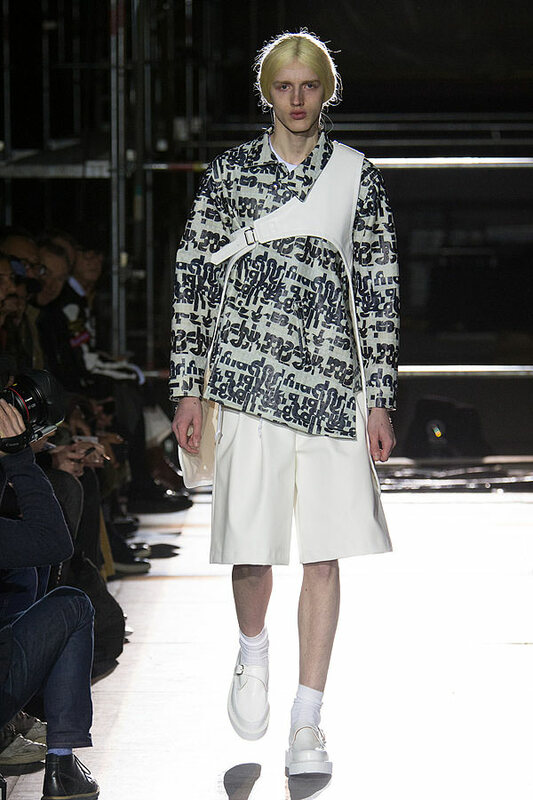 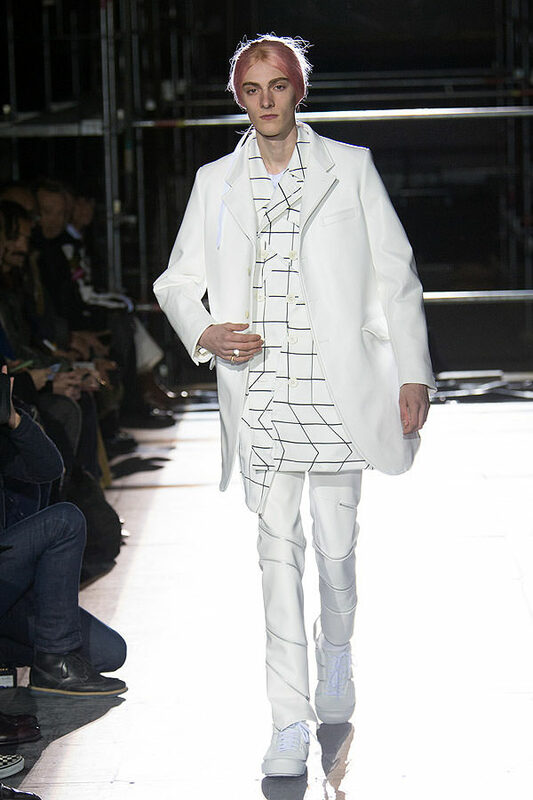 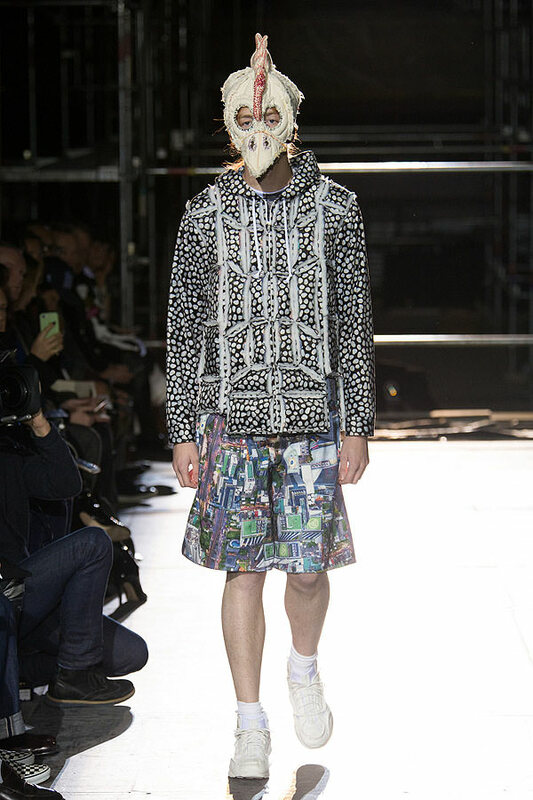 Kawakubo’s boys, who were revealed beneath the mask, now sported thermoformed grid padded armor-like jackets and coating with candy-colored tracksuit bottoms. 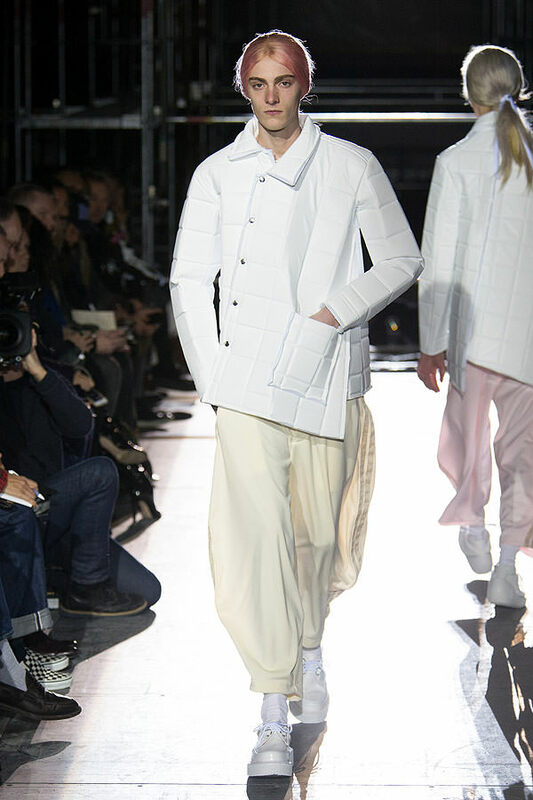 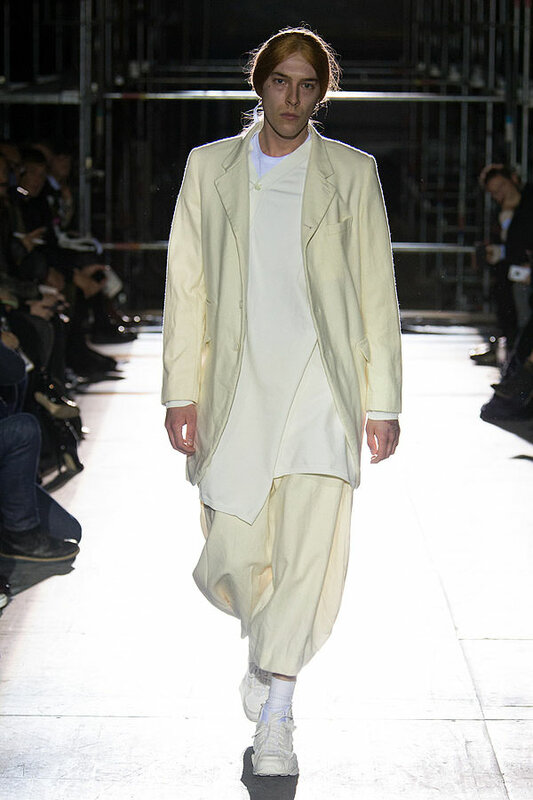 The jackets and pants were twisted, a theme that has been emerging this season, with zips on trouser legs spiraling up the body like a Helter Skelter. 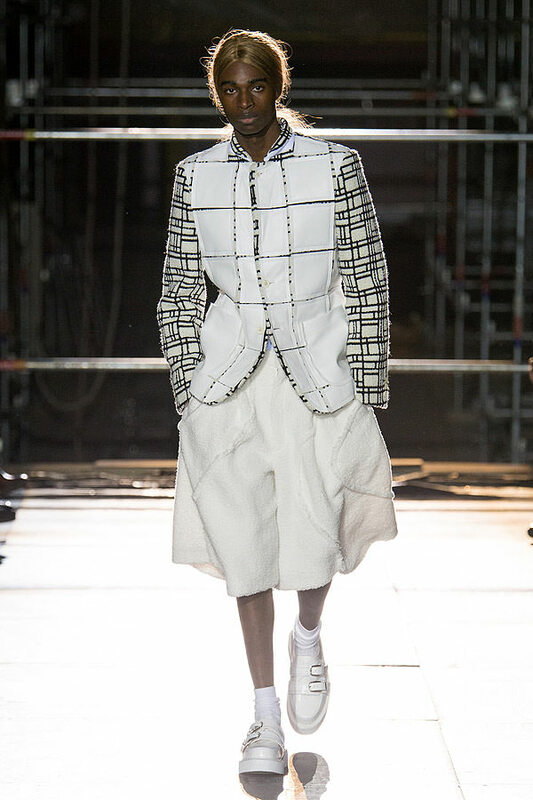 The dress-up feel remained with jackets cut open in large circles at the back, falling in layers like a ladybug's wings, to allow easy access: no need to unbutton these jackets to get into them. 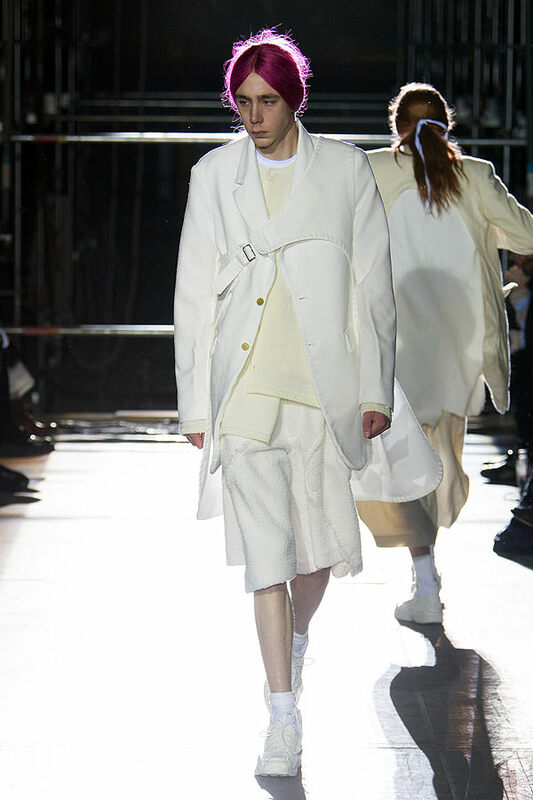 Was it Peter Pan syndrome, or a comment on the innocence of youth? 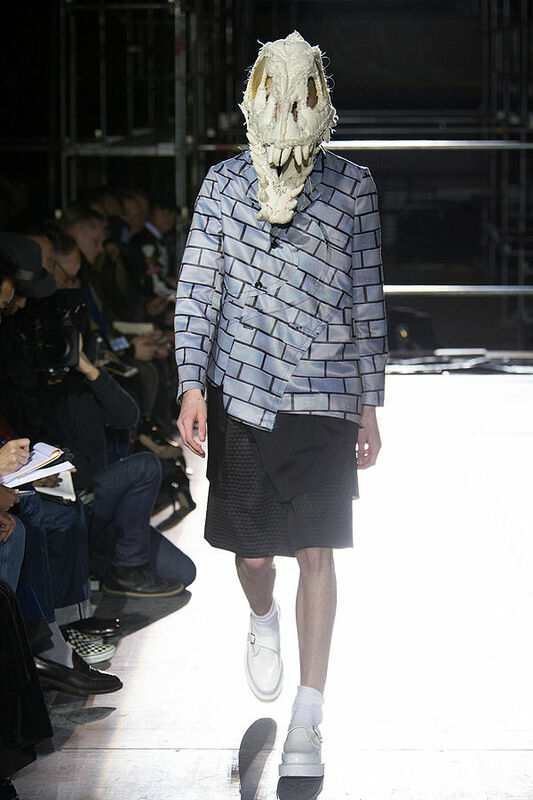 Has the digital age stopped our children living out there youth, carefree, forcing them to grow up too fast? 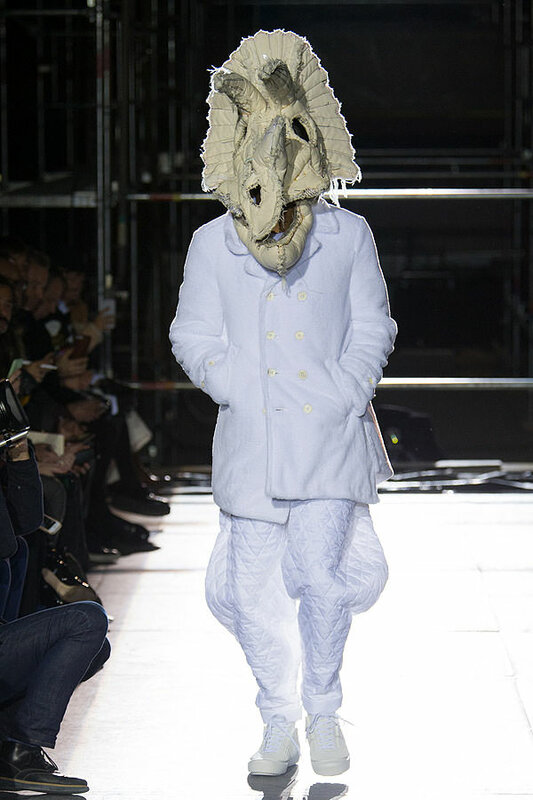 Whatever was on Rei Kawakubo’s mind, one thing was clear: we can always take time out to appreciate dinosaurs and cartoons.